I receive emails every day offering some new (and very expensive) salve, cream or pill for pain relief. All because I bought my mother an ointment for her arthritic knees. Then, I taught her Dynamind, and she now uses this mind-body technique to relieve not only any pain in her knees, but her tension headaches too… balancing her Root and Third Eye Chakras. I first introduced Dynamind in my book, Chakra Secrets, and over a million people around the world are using it to heal themselves of pain and emotional distress, according to its developer, Hawaiian shaman, Serge Kahili King, Ph.D. In Balance Your Chakras, Balance Your Life (FREE today and tomorrow on Amazon Kindle) I show how to use DYNAMIND adapted for each chakra, which I find makes it even more effective as an “instant” healing technique. 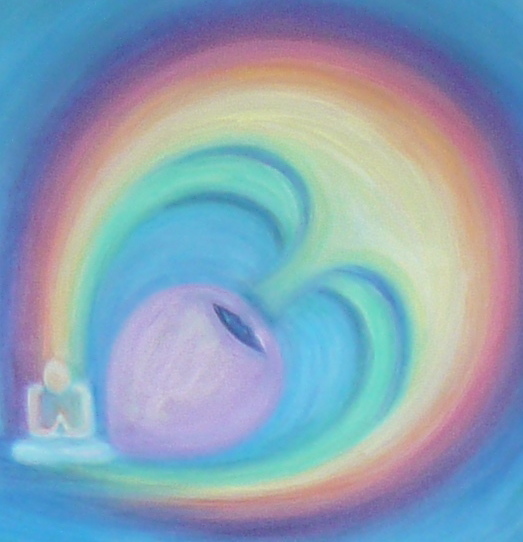 What have others had to say about this method of chakra healing? Yes, there’s even a video which you can also download for FREE, in which you can follow along as I apply Dynamind to healing pain, aches, and emotional problems associated with each chakra. Balance and Tone Your Chakras can be downloaded on my website at www.theChakras.org. Read the full stories of healing, from Root to Crown, in The Chakra Diaries FREE ON AMAZON KINDLE. What is the meaning of life? When you get right down to it, it is to be happy. To experience a life of meaning and joy. 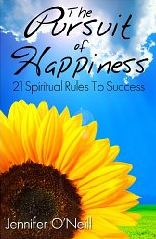 Jennifer O’Neill in her new book, The Pursuit of Happiness, provides a mini-course outlining 21 spiritual rules to finding success. The book was designed with a specific purpose, as a guide to help you tap into your natural ability to be happy. Everyone has the ability to find happiness in his or her life, yet sometimes you need a road map. The Pursuit of Happiness is your spiritual road map. Jennifer’s book can help you enjoy the journey. 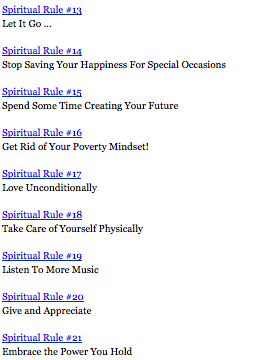 Here’s a snapshot of her spiritual rules. Her explanations of each rule are simple and motivational. I won’t give you the full story here – The Pursuit of Happiness is free on Amazon Kindle today and tomorrow – download it and be inspired! Get your free copy on Kindle, at http://www.amazon.com/dp/B007RGJ07Y.